Here’s A Good Writer/Reader Question: What Would Your Book Be? 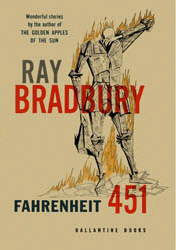 Let’s pretend that Ray Bradbury’s novel, “Farenheit 451” is the society in which we live today. Books are banned, and a group of dissidents determined to safeguard works of literature have taken it upon themselves to memorize their favorite books, as a means of preserving them. So let me ask you: What would your book be? My initial response would be “anything by Ray Bradbury” because I love his work so much. Maybe “The Martian Chronicles” or “The Illustrated Man”. Or maybe I’d be preserving Harry Potter books – God knows I’ve read them all. I have a strong desire to preserve “Jonathon Livingston Seagull”, too. And how about “Goodnight Moon”? How do I pick just one? Anyway, it’s food for thought. Let’s hope it never becomes reality. Want to know all the latest about upcoming projects and release dates? Sign up and follow me!